The Lion is the second largest feline – only the Tiger is bigger. The largest known Lion weighed 826 pounds. Lions that live in the wild weigh less than those that are living in captivity. They are considered to be Vulnerable as a species. Approximately 10,000 years ago there where more Lions on Earth than any other animal with the exception of humans. 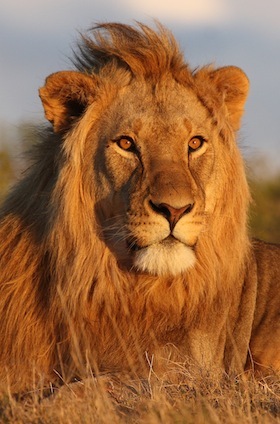 Only the male Lions feature the famous mane. The females are called a Lioness. They are responsible for the majority of the hunting. The average lifespan of a Lion in the wild is 10 to 14 years. In captivity they can live to be up to 20 years old. Of all the feline species the Lion is the most social. They prefer to live in groups than to live a solitary life. The number of Lions in the wild have declined by about 50% over the span of the last two decades. The oldest fossils of the Lion are about 500,000 years old. A male Lion is referred to as a Leo. Some records indicate that there are 12 subspecies of the Lion. Initially that was believed to be true. However, today based on DNA information we now know that there are only 8 of them. The Lion is well known to breed with other felines in the wild. They have also been involved in some hybrid combinations in captivity. These include mating with the Leopard, Jaguar, and Tiger. The Lion is the tallest of all felines. Lion cubs are born with black spots on their bodies. As they get older though they will disappear. The large mane of the male can make it harder for it to sneak up on prey. It can also result in them getting too hot during a chase. This is why they females do the majority of the hunting. The Lion is the only feline that has a tuft of hair at the end of their tail that looks like a tassel. It isn’t understood what the purpose of this is. Early cave drawings of the Lion don’t show them with any mane on the males. Is this an indicator that the mane is part of the evolution process? The White Lion isn’t really a subspecies as so many people believe. Instead it is the result of a genetic change called Leucism. This is still a very rare occurrence in the wild. The Lion can spend up to 20 hours in a 24 hour period resting. The Lion can reach a speed of up to 50 miles per hour for very short periods of time. The Lion has a very small heart compared to other felines. The prey that the Lion consumes often range in size from 420 pounds to 1,200 pounds. The Lion can take part in mating during any time of the year. Only the dominant male in a given pride will have the right to mate with the females within it. Females in a pride often give birth around the same time. They are able to help care for the young. This includes babysitting them and even feeding young that don’t biologically belong to them. Should a new male come into a pride and take it over he will kill all of the young cubs that are there. This allows him to mate with the various females and to create his own offspring. Nuzzling and caressing with the head has been observed among members of a pride. This includes between the same genders and opposite genders.